PIN - SARAH COVENTRY. "TIGER EYE BUTTERFLY" FROM THE 1975 LADY COVENTRY LINE. 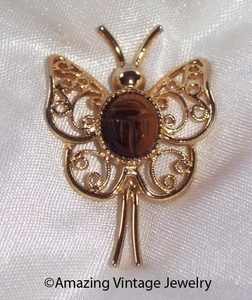 ORNATE GOLDTONE BUTTERFLY WITH A CENTER SCARAB-CARVED TIGER EYE INSET. THIS IS A RELATIVELY RARE ITEM. ABOUT 1 1/2" LONG, 1" ACROSS. VERY GOOD CONDITION.